So that it doesn’t become a pit of sad, freezer burnt food. A friend was joking the other day about a recent experience she had: a power outage forced her to go into the fridge freezer and take a look at what was salvageable and what wasn’t. Way at the back, in the corner, she found a piece of wrapped up birthday cake. From two years ago. Her story got the wheels turning and I realized that it was time for a refresher on how to organize a freezer, so that no little wedges of precious cake are ever lost again. Ah, that favoured mantra, but it’s so true! 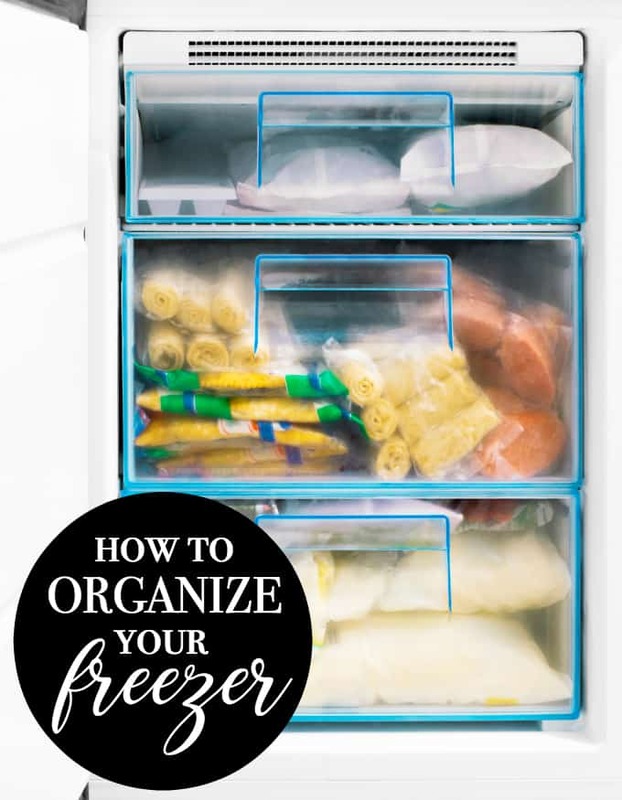 Whether atop the fridge or a chest in the garage, the first step to organizing any freezer is to start fresh. Get a cooler out and move all your frozen foods into it while you remove rogue peas and corn niblets, wipe down the entire interior and start with a clean slate. It’s also a good idea to inventory what you’re going to be putting back in BEFORE you start doing that and check to make sure that there’s nothing that is too old. Piles of different shape and size plastic containers are very space consuming in the freezer but there’s a better way! For liquid based items in the freezer from your most recent batch cooking session, put them in freezer bags and freeze them flat. Once they’re frozen, they can be stacked or stored vertically in a basket. You can get a lot more into the same space this way. Keep a list of what’s in your freezer, on the outside. A magnetic whiteboard, a clipboard with a pencil attached… whatever works for you. Even with the best of organizing intentions, it can get a little busy in what is a small space, so keeping a list—including quantities—of what’s in your freezer ensures that when you’re gearing up for a shopping trip or a meal planning session, you know what you have, what needs to be used up or what you can stock up on because it’s on sale. Save inches by getting rid of the boxes the items were sold in. They don’t add anything in terms of storage and they do end up taking up more space than necessary. If you need cooking instructions, just cut those out and keep them somewhere else. Freeze things in appropriate portions. Part of why some things never seem to get used from the freezer is because the portion isn’t right for your family. Soups and stews can be frozen in family sized portions, or individual ones, depending on who eats them. Or when you buy that flat of chicken breasts on sale, don’t throw the whole package in the freezer as is. Instead, portion it out so that you can pull out and thaw what you would actually need for a typical recipe. Another great way to do this is to wrap and freeze pieces individually, and then group them together in one zip lock bag, so they’re easy to find and not all stuck together when you do find them! Mark the bag with the number of remaining pieces at any given time so that you can do a quick glance inventory (or better yet, make that list outside of the freezer that I mentioned earlier!). This tip for creating single use portions of leftover tomato paste, in ONE baggie, blew me away! Check it out! To keep freezer burn at a minimum, make sure that whatever is holding the food (whether that’s a plastic container or a freezer bag) has the least amount of air possible. Choose sizes to fit your food. If you batch cook and freeze a lot, you might want to look into a vacuum sealer. It’s worth it to avoid spoiled, burnt food! Plus it’s easier to see what’s in the bag when it’s been properly sealed. Don’t forget to label! At some point, most items in the freezer start to resemble one another. Your awesome meat sauce for pasta looks a lot like the pizza sauce to say nothing of the goulash your mother-in-law brought over a week ago. Make sure you label each container or bag, including a date and how much of it is in there, so you can be sure that what you’re reaching in for when you’re cooking is the right ingredient, in the correct amount! The door is the least cold part of the freezer so it’s not the ideal place to store anything that could thaw and refreeze, even partly, with multiple opening and closing. The back of the freezer is, not surprisingly, the coldest part. Put the ice cream and other easy thaw items, including those that contain a lot of fat (which tend to thaw / refreeze fastest), in the back and keep the freezer door holders for the vodka. Stackable plastic bins with lids are ideal for putting foods that go together. For example, all your frozen herbs can go into one. Frozen grated cheese baggies in another. Your pre-chopped onions in another… You get where I’m going with this! If your freezer has a slotted shelf, you can clip bagged frozen veggies and fruits to the underside of the shelf with binder clips. This keeps the items easy to see, organized, and off the bottom level of the freezer, opening up space for other items. The thing with chest freezers is that they’re deep. Black hole kind of deep. Food slips down, never to be seen or heard from again! The best way to keep a chest freezer organized is to use dividers. Magazine holders work very well in this regard for flat frozen soups and stews, but plastic bins of any kind are perfect. Put foods together in groupings, to make it easier to find what you need, quickly. Now that you’re all set up and organized, you’re ready to hit up sales or batch cook your way to weeknight freedom! Let me know if you have any freezer hacks that weren’t mentioned here! You might also like this post about top of the fridge storage ideas, how to organize a chest freezer or refrigerator organization. Thanks for the tips. This is something I really need to do! Thanks for the ideas! I never thought about keeping a list outside the freezer. It would save time!